The D IX, which appeared early in 1918, marked the introduction of a simplified fuselage structure with slab sides and a flat bottom. Nose entry was somewhat slipshod by previous Albatros standards, and the in-line formula was revised, with no spinner. The wings were similar to those of the D VII, but additionally stayed at the intersection of the flying and landing wires, with short link struts in much the same fashion as the French Spad S VII and S XIII. Only one example was built. Engine, 180 h.p. Mercedes D IIIa. Span, 10.4 m. (34 ft. 1 1/2 in.). Length, 6.65 m. (21 ft. 9 7/8 in.). Height, 2.75 m. (9 ft. 0 3/8 in.). Weights: Empty, 677 kg. (1,489 lb.). Loaded, 897 kg. (1,973 lb.). Speed, 155 km.hr. (96.875 m.p.h.). Climb, 1,000 m. (3,280 ft.) in 4 min., 5,000 m. (16,400 ft.) in 35 min. Duration, 1.5 hr. Armament, twin Spandau machine-guns. 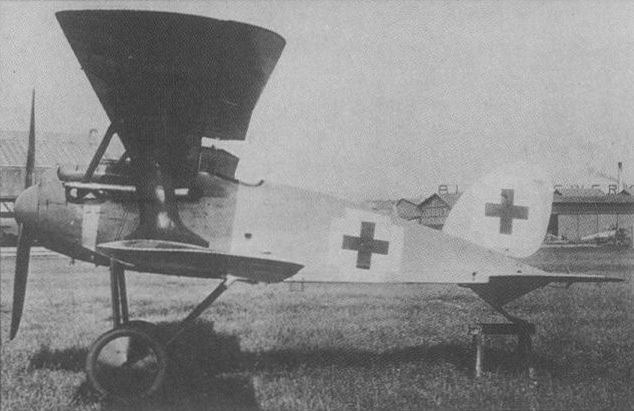 Another of the early 1918 prototypes from Albatros was the D X. The slab-sided fuselage of the D IX was retained, but a neatly spinnered vee-eight Benz IIIb of 195 h.p. was installed. Simplified wing bracing utilizing I struts was introduced, and the centre-section bracing was reinforced by a strut running right down to the lower wing root. This aircraft, serialled 2206/18, took part in the second D types Competition at Adlershof in June 1918. At a loaded weight of 888 kg. (1,954 lb. ), it attained 5,000 m. (16,400 ft.) in 22 min., but on another occasion took 35.6 min. to reach the same height, taking 17 min to climb the last 1,000 m. Span, 9.84 m. (32 ft. 3 3/8 in.). Length, 618 m. (20 ft. 3 1/4 in.). Height, 2.75 m. (9 ft. 0 3/8 in.). Weights: Empty, 666 kg. (1,465 lb.). Loaded, 905 kg. (1,991 lb.). Speed, 170 km.hr. (106.25 m.p.h.). Duration, 1.5 hr. Armament, twin Spandau machine-guns. 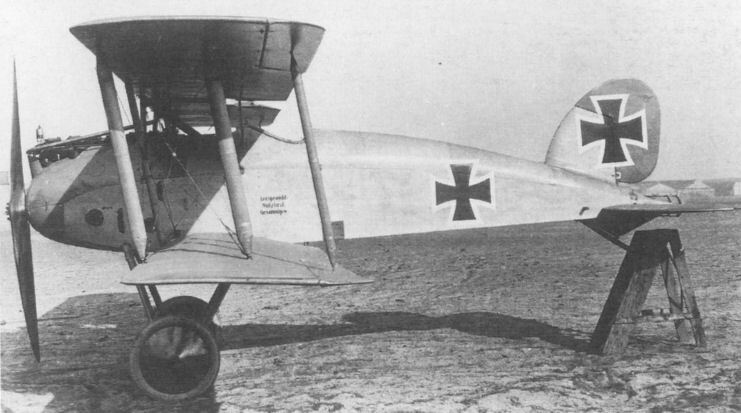 Unlike previous Albatros fighters, the DIX featured a slab-sided, flat-bottomed fuselage. The wings were similar to those of the D VII, as were also the tail surfaces, power was provided by a 180 hp Daimler D IIIa engine, and armament consisted of the usual twin synchronised 7,92-mm LMG 08/15 machine guns. The sole prototype appeared early in 1918, but performance proved disappointing and development was discontinued. Max speed, 96 mph (155 km/h). Time to 3,280 ft (1000 m), 4 min. Empty weight, 1,492 lb (677 kg). Loaded weight, 1,977 lb (897 kg). Span 34 ft 1 1/2 in (10,40 m). Length, 21 ft 9 7/8 in (6,65 m). Developed in parallel with the DIX and possessing a similar slab-sided fuselage, the D X was powered by a 195 hp Benz Bz IIIbo eight-cylinder water-cooled engine, and participated in the second D-type Contest held at Adlershof in June 1918. Armament comprised the usual pair of machine guns. Development progressed no further than prototype trials. Empty weight, 1,468 lb (666 kg). Loaded weight, 1,995 lb (905 kg). Span, 32 ft 3 1/3 in (9,84 m). Length, 20 ft 3 1/3 in (6,18m). The sole example of a simplified Albatros fighter, the DIX, was partly an attempt to simplify production at a time when greater numbers of aircraft were required - however, it failed to achieve anything like a reasonable performance and was quite rightly discontinued. Albatros D.IX prototype at the Albatros Factory at Johannisthal. In the back ground is Adlershof, the airfield and Hq of Idflieg. A parallel development to the D IX, the D X (on photo) participated in the 2nd D-type Contest of June 1918.